As consumers spend more time shopping on smartphones, their expectations for mobile experiences have soared. With mobile interactions influencing $1.05 trillion in offline sales in 2016, the successful retailers of 2017 will be those that offer consumers mobile sites with a frictionless path to purchase that also integrates into omnichannel shopping experiences. Which omnichannel retailers are doing it right and setting the bar the highest for merchants looking to deliver a seamless mobile customer experience (CX)? UserTesting recently published its inaugural Retail Mobile Customer Experience Index, a competitive benchmarking study that compared the mobile web user experiences of the top eight Fortune 100 retailers: Best Buy, Costco, The Home Depot, Lowe's, Macy's, Target, TJ Maxx and Wal-Mart. For the study, 800 consumers attempted to complete a series of standard online shopping tasks on the retailers’ mobile sites and then responded to rating-scale questions about their perception of the site based on ease of use, speed, credibility, aesthetics and delight. Best Buy, The Home Depot and Target earned the top three spots overall, scoring high across all five user experience (UX) factors, especially ease of use and speed. 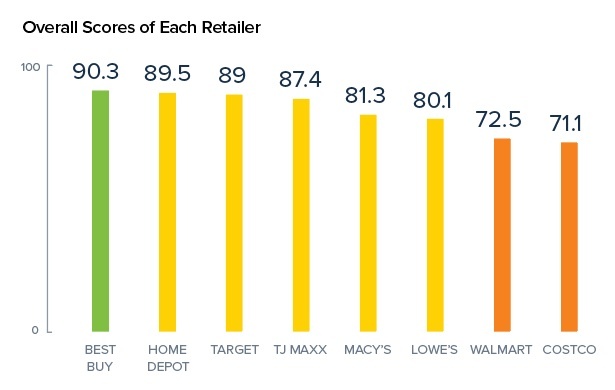 While overall scores for these top-performing retailers were all fairly high, Costco and Wal-Mart had the most opportunities for improvement, including better transparency around pricing and shipping. Here are three of the factors covered within the Retail Mobile Customer Experience Index. Ease of use, which is measured by customers’ ability to complete tasks without difficulty, greatly impacts a mobile website’s conversion rate — and a retailer’s ability to drive in-store traffic. The study had shoppers attempt to locate an item, review shipping information and find a store location, rating their experience and ease or difficulty of each task. Best Buy nailed this factor because of its focused and intuitive navigation design, especially via the structure of the main menu and its search bar. Lagging most in ease of use was Costco, whose main focus is warehouses, rather than e-commerce. Shoppers used words like “frustrating” and “inconvenient” to describe Costco's mobile CX because they weren't able to view pricing without membership. Undoubtedly, it helps to have a name brand in order to establish trust with consumers. Shoppers need to feel comfortable in order to provide their credit card information. Measured by customers’ level of trust in the company (including after their mobile experience), credibility was the highest-scoring factor, with all eight retailers in the study performing well with scores in the 80s and 90s, due in part to the retailers’ well-established, easily recognizable household names. Research from Google shows that people process initial impressions of a website’s aesthetics within 50 milliseconds of arriving on the page. Consumers today expect mobile sites to have clean, uncluttered designs. UserTesting asked shoppers whether they found the site “pleasing to the eye.” All eight retailers performed exceptionally well in the visual design factor. Target scored 93.9 as the highest. TJ Maxx scored the lowest with 85.2, receiving critiques related to its simplistic color scheme and lack of bold call-to-action buttons. Retailers that have yet to invest in researching and improving the mobile and omnichannel experience will face stiffer competition from their more customer-centric counterparts. eMarketer forecasts m-commerce sales to grow 36 percent in 2017, reaching $157.1 billion, and jumping to $337.3 billion by 2020. For retailers that want to remain relevant in what Forrester calls “the age of the customer,” the time has come to invest in understanding and improving customer experiences across all channels. Brian Smith is vice president of marketing at UserTesting, an advanced user research platform. Brian Smith is VP of Marketing at Mountain View, CA-based UserTesting.